The Boy Scouts have had a proud tradition of performing service projects in Glacier National Park as far back as 1925. 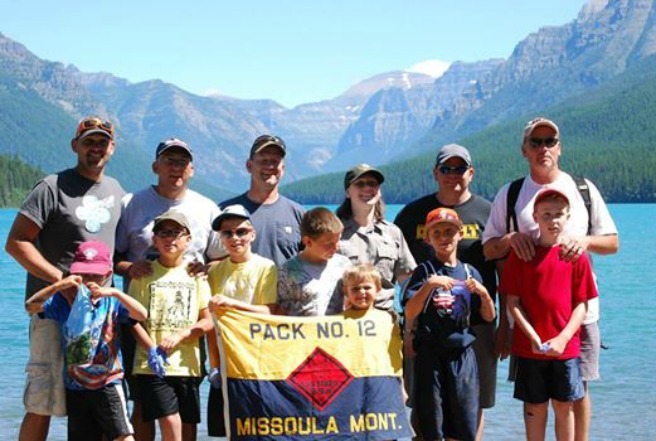 Since the BSA Centennial in 2010 Scout units from Montana and Canada have performed outstanding service to Glacier National Park each summer. The patch above is the same design as the patch from 1925 to 1937. This award is to recognize those Scouts and Scouters who devote a minimum of 15 service hours in Glacier National Park. Those desiring to participate in this event must sign up for one of the six weeks initially scheduled. A designated week runs from Sunday to Saturday. The unit is to arrive at the beginning of their week and be given a designated project to work on by the park. Units will have some flexibility in performing their hours of service so they can also enjoy the wonders that Glacier National Park has to offer. The park will wave the camping fee during the time the service project is being performed. Once the project is completed then the unit must pay the normal camping fee.